A little while ago we received some goodies from GOSEN to review. 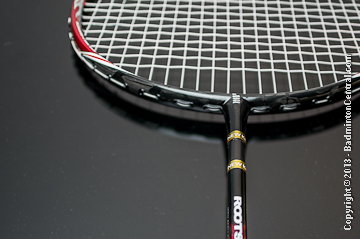 Among the goodies is a Gosen Roots Aermet Zeus racket. The Gosen Roots series has been around since the late 90’s. 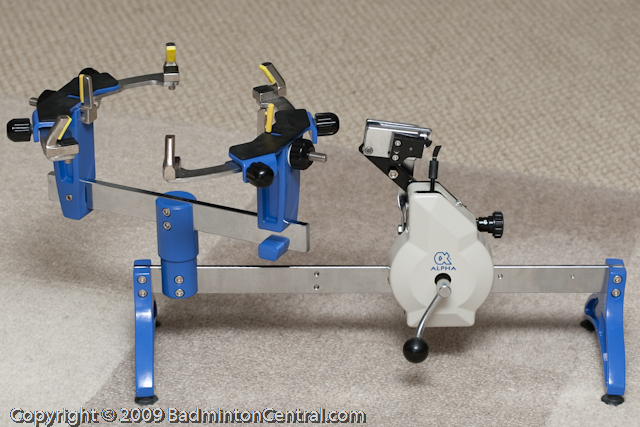 Over the years it has evolved a bit with different models but the center piece of technology is the 2 kick point system. In which a thinner section is introduced near the top of the shaft, just under the T, to artificially create a flex point that create more power and resilience. The Root Zeus is one of Gosen’s top model. A claimed 88g weight is matched with a medium balance point and stiff shaft. A moderate Isometric shaped head is matched with a standard 76 holes, 3 pair of non-shared hole pattern. 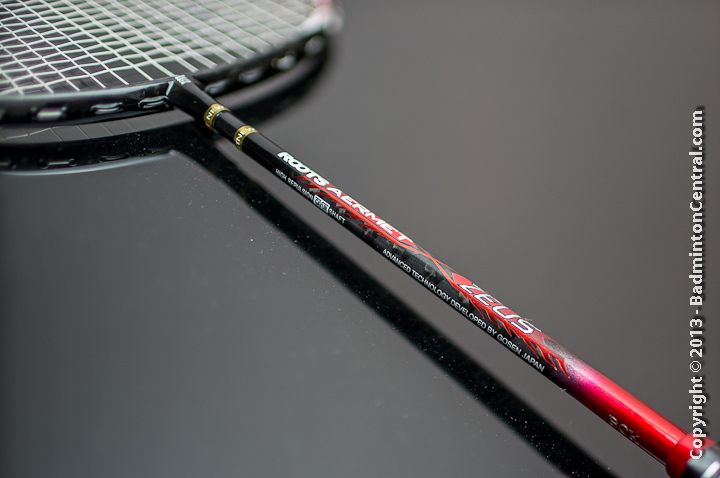 The racket is a pretty one. A dark red and black color scheme gives it a very much refined look. Upon closer inspection at the frame reveals what seems to be a raw UD (Unidirectional) carbon layer under a clear coating, upon even closer look seems to reveal some deliberate but very sparse weave pattern. The black clear coated carbon is accented on the 3/9 o’clock positions with dark red, while the shaft is painted black and accented with the same dark red. The review copy I have lands close to spec at 88.8g and 285mm balance point. Dry swing shows that it is nicely medium balanced which should make it quite maneuverable. 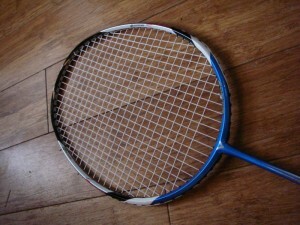 Stringing the racket was no problem at all. The quality of the grommet is quite good but not the top quality that I have seen. The stiff frame didn’t give much at all when strung with my standard test string Zymax 65 @ 24lbs. While two kick points has been around for a better of a decade and a half, I have never used it for more than a few swings. What i have noticed right away that it is something that certainly need time to get accustomed to. On drives, all my shots are off, a shot that would normally grace the net tape suddenly are lower than usual, a drive down the sideline would be end up outside the court. 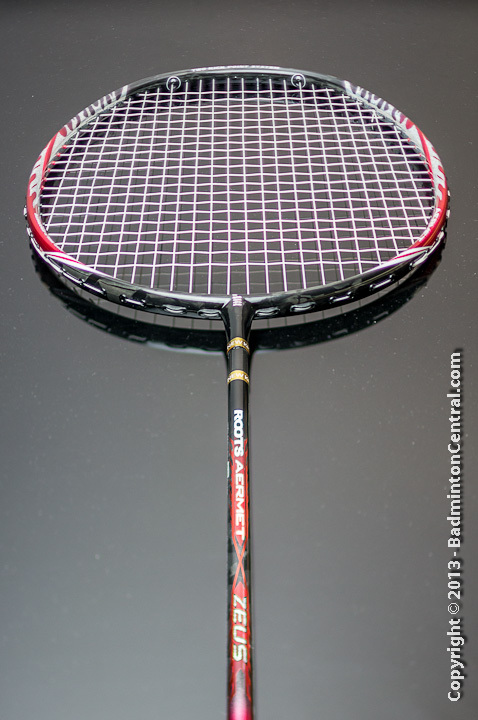 Whatever effect the two kick point has, didn’t do much in terms of racket head stability. This maybe something that the player will get accustomed to over time, as we humans are very adaptable. Unfortunately I wasn’t able to get used to it despite trying with it over the course of 2-3 weeks review period. Including many sessions of drill as well as double games. On lighter shots like net shots, the Zeus holds up well, there is slight amount of dampening but overall it provide good feel and touch. I have similar issues with clear and smash, where I found it difficult to adjust to the direction as well as force control. The extra stiffness of the shaft didn’t help either. 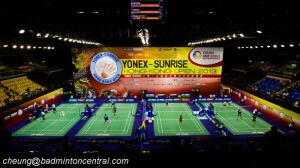 Upon really forcing it with full strength hits, I was able to feel what the racket is capable of. The shaft do not appear to be particularly lively. 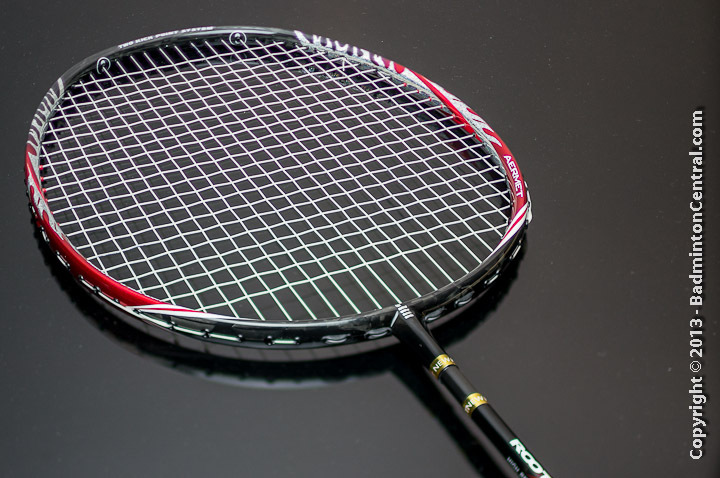 Overall, I think the Gosen Roots Zeus is a power oriented racket that has potential, but the user of the racket will need a lengthy adaptation period to fully take advantage of the racket designed abilities. Unfortunately, this may not be a racket that will be taking a regular spot in my racket bag.